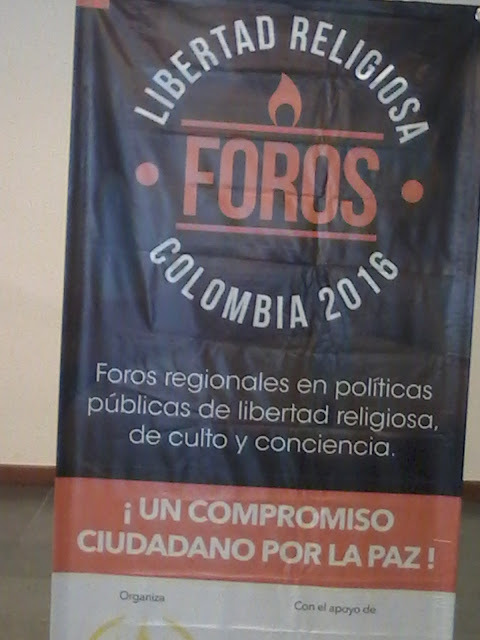 Today I was able to attend the Foro Regional Libertad Religiosa (Regional forum on Religious Freedom). It is encouraging to see the discussions around how the construction of peace is the responsibility of every sector of society, including the religious sector. The issue of religious freedom has played a role in the Colombian conflict, therefore is a necessary area of society to be addressed in constructing peace. The sign for the Regional Forum on Religious Freedom, the Forum will be held in four other cities around the country with the objective of building an inter-religious network to develop public policy, promote coexistence, and work towards national peace.